Digitel GSM takes home the award for fastest average download and upload speed in Tutela's October report, thanks in large part to the availability of its 4G network. While Movistar's 4G network performs well in locations where it's available, the reliance on its 3G network drags down the average download speed that users experience. The data, which comprises 2.47 billion measurements taken from August 1st - October 31st 2018, tells an interesting story about average throughput speeds in Venezuela. Movistar actually has the fastest 4G network in the country, with speed tests over 4G averaging 8.12 Mbps, compared to 7.71 Mbps for Movilnet, and 6.50 Mbps for Digitel GSM. However, Digitel has 4G deployed to more towers than Movistar, which relies heavily on 3G for coverage outside of dense urban areas. Although Movistar's 3G network is faster than Digitel's 3G network -- 2.66 Mbps compared to 2.44 Mbps -- 4G is inherently faster for users than 3G, which explains why Digitel has the fastest average download speed when combining 3G and 4G results. Movilnet delivered the best packet loss and jitter of any of the 4G networks, with just 1.4% of data packets lost on average, and a jitter of 4.4 ms -- well inside Tutela's thresholds for a consistent data connection. Despite Digitel's strong showing in download and upload speeds, 3.8% of packets travelling over its 4G network are lost; combined with a jitter of 6.2 ms, customers using real-time apps like video calling may see decreased performance. 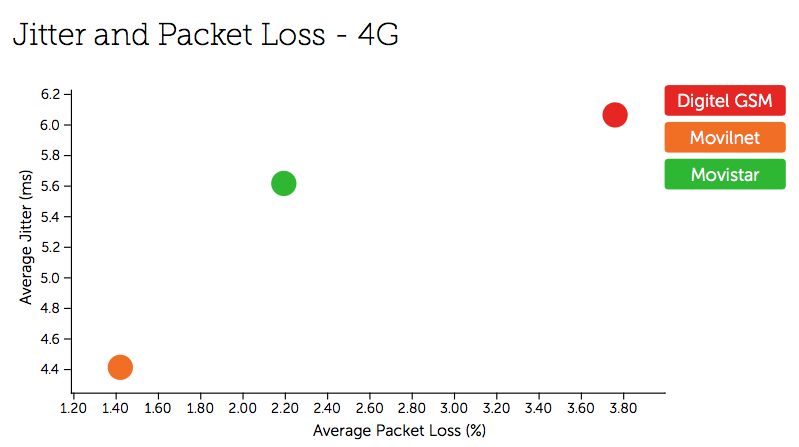 Over the 3G network, Movistar had the best packet loss at 3.1%, with Movilnet averaging 4.3%. Digitel was in the middle with an average packet loss of 3.6%, but had the lowest jitter at 14.5%. Digitel delivered the lowest latency for its subscribers, averaging 51.3 ms over 4G and 124.6 ms on 3G. Movistar had the worst 4G latency with an average of 56.5 ms, but a 3G latency much closer to Digitel at 127.3 ms. Movilnet's 4G latency was just 1 ms higher than Digitel's, but 3G latency was noticeably the worst, at 148.7 ms.
Tutela's findings for Venezuela are based on 2.47 billion measurements recorded between August and October, including 107,000 active speed tests and a total of 7.82 million response tests. Our latest complimentary Mobile Experience Report is available to download from the Tutela Insights portal.